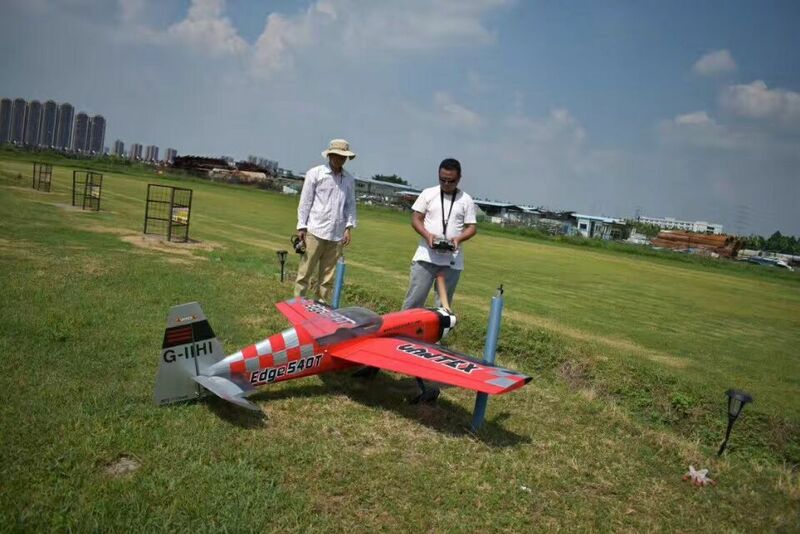 RC aeroplanes have several moving surfaces that are controlled by the transmitter. The signal from the transmitter is translated into servo movements by the receiver. The servos turn and either push or pull on the pushrods. The pushrods make the control surface move and change the plane's position in the air. The pushrods, control horns, servos, receiver and on-board battery pack all have to be installed prior to flying the plane. 1) Create pushrods to run from the servos to the control horns. Pushrods can be made from metal rod, carbon fibre rods, wood or plastic. Make sure the length can be adjusted by up to 1 inch. 2) Locate the plans or instruction manual for the plane you are building, they will show where the servos need to be mounted. Some kits have a plywood servo tray included that gets built into the fuselage. If your plane does not have a servo tray, use the one that came with your RC equipment. 3) Test fit the servos into the tray and make sure the servo arms can rotate without hitting into each other or the sides of the fuselage. Trim the servo arms so that only the arm that will have the pushrod attached is left. 4) Mount the alieron servos according to the plans; there will either be one servo in the centre of the wing that attaches to torque rods in the trailing edge of the wing or two servos, one mounted in each half of the wing that connect to the alierons directly. Mount the servos securely with wood screws. 5) Mount two servos in the servo tray in the fuselage to control the elevator and rudder. There should be two exit points near the rear of the fuselage--one for each pushrod. The pushrods should cross inside the fuselage; the servo on the right should have its pushrod exit on the left and vice versa. These servos are also mounted with wood screws. 6) Install the throttle servo towards the front of the fuselage. Throttle servos are used to control nitro or gas burning engines, electric planes use an electronic speed controller which mounts differently from a servo. Try to keep the throttle pushrod as short as possible for best results. 7) Wrap the receiver in protective latex foam rubber and mount it firmly in the fuselage with fabric fastener. The foam rubber dampens vibration in flight and provides protection in a crash. 8) Mount the on-board battery pack. Since the pack has some weight to it, you can use that weight to help balance the plane. Hold the plane at the suggested centre of gravity and see if the plane is nose- or tail-heavy. Move the battery pack fore or aft to help bring the plane into balance. This will help reduce or eliminate the need to add lead weight to achieve proper balance. 9) Test the installation by powering on the transmitter and reciever. Make sure all control surfaces move in the direction expected. Use the transmitter's servo reversing switch to correct any surface that moves opposite to what you expect.